Heroes Aren’t Hard to Find is a Donation Drop-Site for Toys-For-Tots! We will be collecting New, Unwrapped Toys in our store (located at 417 Pecan Avenue, Charlotte, NC 28204) until December 2nd! 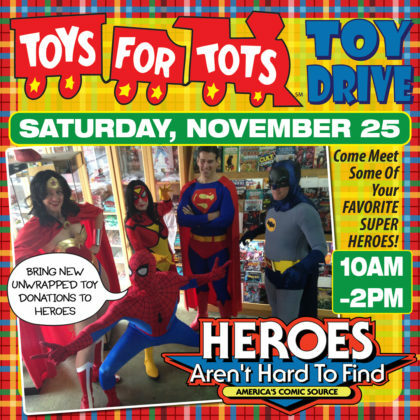 We will be hold our Annual Toys-For-Tots Drive with a few of our FAVORITE costumed Heroes and Heroines on Saturday, November 25 from 10am-2pm! We hope that you will be able join us and help to insure that every child can receive a new toy this holiday season!